We would like to sincerely thank Sunil Lulla garu from Eros International, Sharrath Marar garu from North Star Entertainment, Raj Kumar garu and Vasu garu from iDream media for giving us an opportunity to screen such a prestigious project! 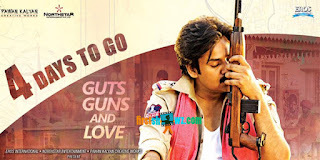 Sardaar Gabbar Singh is one of the most eagerly awaited Telugu films of 2016. Pawan Kalyan will be reprising the role of Gabbar Singh, a dashing and maverick cop who is posted to Rattanpur this time. For Sardaar Gabbar Singh, Devi Sri Prasad (DSP) is scoring the music and Arthur Wilson is the cinematographer. Kajal Aggarwal is teaming up with Pawan Kalyan for the first time in her career. The film also stars Raai Laxmi, Sharad Kelkar, Sanjana, Mukesh Rishi, Brahmanandam, Brahmaji, Posani Krishna Murali and several other leading actors from Tollywood. Directed by KS Ravindra (Bobby), the film, is being jointly produced by Sharrath Marar under North Star Entertainment Pvt. Ltd. and Eros International banner. The movie is slated for a grand release on our Telugu New Year (UGADHI) -April 8th! With huge anticipation and positive buzz, Sardaar Gabbar Singh is all set to create a new benchmark in the Telugu Industry. We also hold screening rights for Stylish Star Allu Arjun's "Sarrainodu" and Prince Mahesh Babu’s “Brahmotsavam” for AUS/NZ.